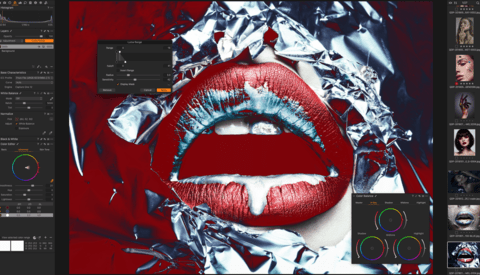 Capture One Pro is a behemoth of a raw converter. Its ability not only to bring out amazing detail in raw files but also to efficiently organize photos before, during, and after a shoot is truly impressive. If you haven't used Capture One before, or if you're just getting started, here are some suggestions for how to get the most out of the software's approach to organization. 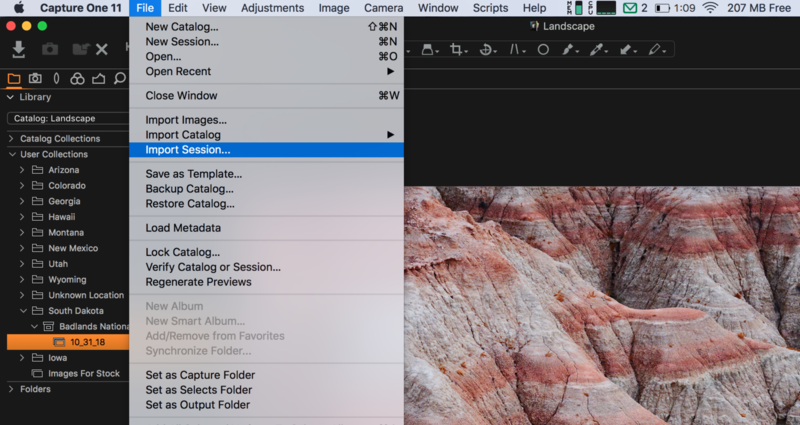 Capture One uses two primary methods for organizing files: Sessions and Catalogs. Both have their merits and drawbacks. While you could easily choose to use only one of these methods, I highly recommend at least trying your hand at using both in conjunction with one another. This gives you enhanced flexibility with your file structure and allows you to have more freedom out in the field. But before we talk about using Sessions and Catalogs together, we have to discuss what each of them does differently. When you open Capture One for the first time you'll be asked if you already are familiar with Capture One. If you say no, you'll be automatically brought into Capture One's Catalog based workflow. Catalogs work just fine, but you can get a lot more out of the program if you use Sessions as well. In years passed, Sessions were Capture One's de-facto method of organization. 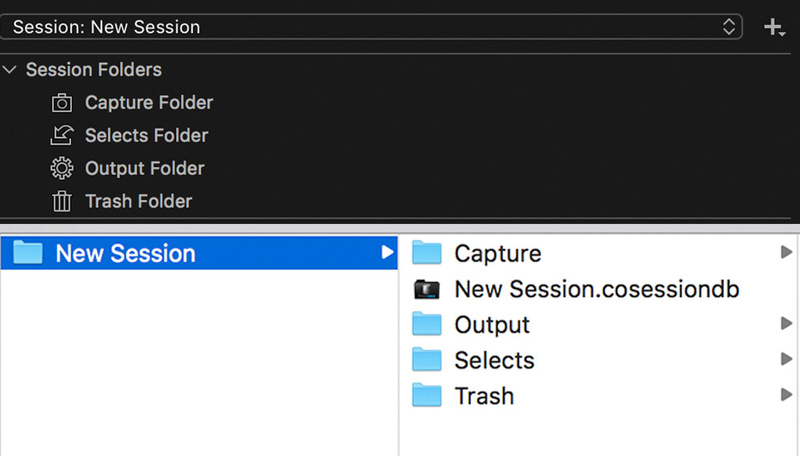 When you create a new Session, Capture One creates five folders on your hard drive: a parent folder with the same name of the session you've created that contains the Capture Folder, Selects Folder, Output Folder, and Trash Folder. As stated above, Capture One creates folders with these names with each new session you make. However, true to Capture One's philosophy of circus-performer-esque flexibility, you can enable any folder on your hard drive with the above qualities, thereby making any folder of your choosing the "Capture" folder, and so on. This is especially useful when tethering and organizing photos on-set. Output Folder: contains all of your converted JPEGS, TIFFS, etc. Sessions are typically made on a per-shoot basis, although I'll expand on other options shortly. You have a headshot shoot next Tuesday? Make a new session. Going on a road trip over the weekend? Make a new session. Have a boudoir shoot on Thursday? Make a new session. Sessions are designed to handle a few thousand images, but after you get into the 3k+ area you may experience performance issues. This is why Sessions are best per-shoot and not for an entire body of work. Sessions have the benefit of containing everything from a particular shoot all in one place- inside the parent folder. This is a good thing because it's so easy to create backups. At the end of the day after you've made selects, created crops, processed files, etc. all you have to do to make an exact duplicate of everything from your shoot is copy the parent folder and paste somewhere else. No large database to keep track of, no virtual path to maintain. Simple. I love sessions and encourage as many people to use them as I can when I teach because it encourages you to understand where your files are on your operating system outside of a piece of software. Because the folder structure is so simple and easy to understand, (Capture, Selects, Etc.) you can navigate to a raw file or processed TIFF years after the fact with ease without ever opening the program. If a client asks to re-license an image from a shoot years ago but you can't find it because you jumped the gun and updated your OS without checking Capture One's compatibility, you'll likely still be able to navigate to the session folder, peek inside the output folder, and voila. You can also think of a Session in Capture One Pro like a 1:1 representation of what's on your hard drive. Using the system folders function, you can use any session in Capture One like a file browser. 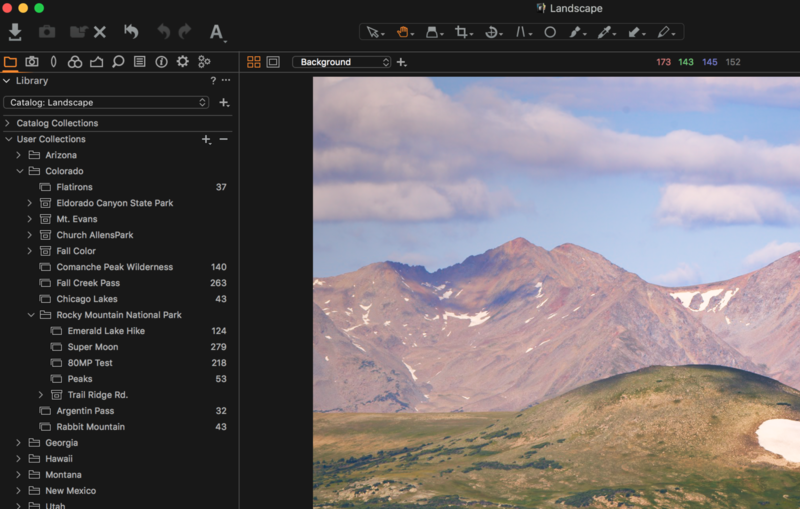 Navigate to any folder on your local or connected external drive and use Capture One to view and even edit and retouch images without having to import them. The best part? Any other Session you use to navigate to those raw files will reflect the edits you've made thanks to Capture One's handy sidecar folder system. Because of this ability to browse and edit without having to import or even use the Session that was originally associated with the images I'm viewing, I sometimes use a Session without any images in the Capture Folder named "Utility Session" which is dedicated to nothing except browsing other images on the fly. For years Capture One only used a Session based workflow. 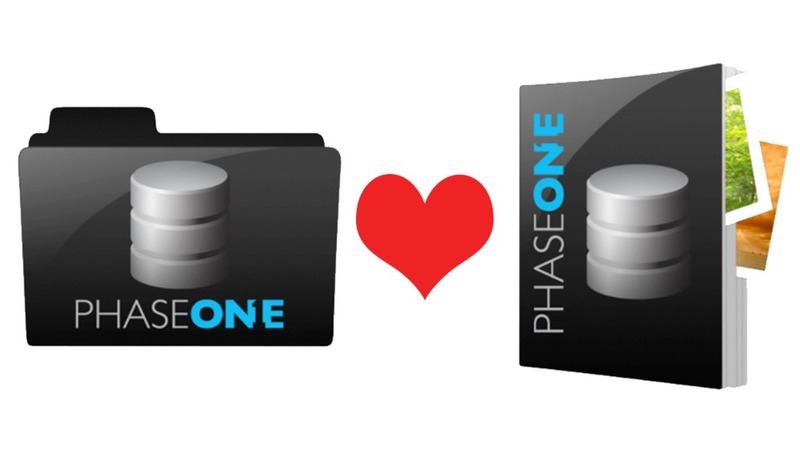 Phase One recognized the popularity of larger database-centric organizational structures used by the likes of Lightroom and the now abandoned Aperture and provided the option of using Catalogs as well as Sessions beginning with Capture One Pro 7. The fundamental way in which images are edited are identical in both Sessions and Catalogs, but the way files are organized and navigated through are very different. Unlike Sessions which are meant to house a typical number of images in a photo shoot, Catalogs are designed to house a large body of work and can handle many thousands of images. Catalogs will be familiar to those coming from Lightroom. They rely on a single database file that is best left on a local drive for optimum performance, however images can be saved wherever you like. In a "referenced" Catalog, the Catalog keeps track of your photos by remembering a folder structure path. It is also possible to save RAW files within the Catalog database file (a "managed" Catalog), however I strongly recommend against this. If a database isn't backed up properly and becomes lost or corrupted, there's no guarantee you'll get your RAW files back. This is not an issue if you keep your original RAW files outside of the database file. The database file is simply the user interface of Capture One which contains your virtual organization, image previews, edits, and other backend files. Unlike a session which is based on a per-shoot mentality, Catalogs can be created to satisfy a variety of organizational preferences. For example, you could create a Catalog per year, per client, per genre, or use a single Catalog for all your past and future images. After you've created your Catalog you have the option of creating virtual organization within the Catalog. This is accomplished by using Albums, Smart Albums, Projects, and Groups. Unlike Sessions, these terms have no analog in your physical hard drive. They exist only within the database file. This type of organization is nice because it allows you to be as creative and flexible as you want, and because it's completely virtual, you have the option of being able to access the same image in a variety of ways without duplicating the image file. Projects: Like Groups, they can exist on their own or in Groups. Projects cannot contain images, but can contain albums and smart albums. When placed in Projects, Smart Albums will only search the images contained in Albums within the Project. Albums: Only organization that can actually "contain" images in a Catalog. Can be nested in Projects, Groups, or can exist on their own. Smart Albums: Albums which are constantly applying search criteria. For example, all 5 star images that are also color tagged red. When placed by themselves or within Groups they will search every image in the Catalog. When placed in a Project, they will only search images within the Project. Catalogs lack the flexibility of Sessions in that you have to import images in order to edit them and can't browse your hard drive through the lens of arguably the best raw converter available, but they have the strength of being able to handle very large numbers of images, and in doing so, can be used to keyword and organize to the Nth degree. Another benefit to Catalogs is that, should you choose to house your images on an external hard drive but leave your Catalog database file on your local drive, the Catalog will create smart previews so that you can continue to edit, organize, and keyword your images even if your external drive is disconnected. Now that we've discussed what Sessions and Catalogs are and how they differ from one another, let's talk about how we can use them in conjunction with one another. Personally, I use Catalogs based on genre. I have a Food Catalog, Landscape Catalog, and Magazine Catalog. These Catalogs house thousands of images and "contain" all the images I've ever shot in those genres. Because of that I can search within those Catalogs easily and find the images I'm looking for. My Catalog database files live on my local drive, but my raw files are housed physically on a large external hard drive. If I'm about to go out on an editorial shoot, I'll create a Session for that shoot. I'll tether into the Capture Folder, talk with the client about selects and aesthetics, and maybe even start editing. I'll also make a couple backups of the parent folder for redundancy and feel content knowing that the all-important shoot I just completed is self contained and easily accessible. Once I'm done with the shoot, I'll head back to home base where I place the session in my large external hard drive next to my other editorial Sessions. I then import the Session (along with its keywords, edits, albums, etc.) into my Magazine Catalog to be housed for future reference. This way I have the flexibility and redundancy of a simple Session based workflow out in the field as well as the complex organization of a Catalog based system after the shoot is over. To import a Session into a Catalog, open a Catalog, then click File > Import Session. You'll then navigate to the Session you would like to import into your Catalog and highlight the file with the extension ".cosessiondb" which is the Session's database file. Capture One will then import all of the image-containing folders from the Session (Capture, Selects, Output) as well as any Albums, Smart Albums, favorites folders, keywords, edits, etc. as a Project into your Catalog which you can then organize using the Catalog's virtual organization. The Session you imported still exists on your hard drive, still contains all of your raw files, and will remain unaffected after the import. It's important to note that changes you make in the Catalog to the now-imported Session will not be synchronized to the Session on your hard drive, therefore its recommended that you place the Session in its final resting place without the intention of returning back to it before importing into a Catalog. This organizational technique has been wonderful for my workflow, but everyone has their own methods. Do you use Sessions? Catalogs? Both? Do you intend to experiment with Sessions after reading this article? Let us know! Zac Henderson is a full time digital nomad traveling the US. He specializes in environmental portraiture, landscape, food, and fine art photography focusing on his interest in a cosmic perspective. He also provides training and technical support for Capture One and Phase One medium format camera systems. Zac! Hope you're doing well sir!! I never understood the logic of separating the cart from the horse. Although I work in LR, I make a catalog and keep the database WITH the RAW files and the renders. Everything in one place, in a project folder. I then make a redundant backup of the whole thing. I do that for every project, I make a new catalog for every single photo session. The idea of having one massive database for everything is the dumbest thing I've ever heard of. It's a sound workflow- essentially a Capture One-Session based workflow just with Catalogs Instead of Sessions. The benefit of a large Catalog based system of course provides heavy filtering and search options across a huge library of images, whereas a Session based workflow relies on more OS driven manual organization but has the benefit of self-containment. I agree. Working with one large catalog allows someone like me who works at a college to have access to all the metadata and tagging Lightroom has in one place, instead of opening up a new catalog every time I need to search for a particular photo. I suppose it depends on what you're doing. For my shooting it's unimportant, files are meta-tagged and easily accessible, but at least both primary programs give you the option to go either way. I guess as long as you keep your database VERY well backed up you're fine. Not if your sessions are related. I often have to search through 5+ years worth of sessions, related to the same project or related projects. I'm sure there are other situations where a catalog approach makes sense. My files, however, are separated by project, phase and date. XMP files are created and stored with the raw files. I use sessions only since they are most portable. Once I am done with my edits I can throw the session folder on to backup drives or cloud and still have my session data - edits, metadata etc - move along with it. 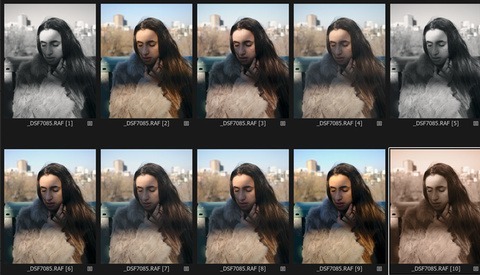 Free advice: Capture One is the best RAW converter out there. Use catalogs per year or semester as default for your archive, use sessions only for browsing or to make lowres versions with proofing of processed files; and save files inside a catalog when in the field on a laptop, later to be imported in your mother catalog on your main computer then take the RAW files out. Works perfect! It's a interesting workflow. I'm in the transition period from Lr to C1 because of the lack of support for Fuji files by Adobe. I usually keep all my raw files in a single folder/year and the exported jpegs in their folder named by the subject. But now, I consider using Sessions for my commissioned work and catalog for everything else. Thanks Zac for this clear explanation of the systems. Thanks for the kind words Marius. Good luck in the transfer! I'm sure Capture One won't disappoint you. No for sure. Especially now with version 12. Luminosity masks and Fuji film simulations are a winner for me. Thank you Zac - a very helpful article as I’m moving over to Capure One. A question about the external drive. Does it matter if it’s blazingly fast or not? 1TB would be enough for me, so there are Thunderbolt SSD options, but very expensive compared to USB 3. Will that make a difference with a database stored locally and the RAWs on the external disk? Hi Ben, I'm glad you found it useful! Regarding your question, a fast external drive will improve performance, but not drastically so. The main performance increase will be in preview rendering and output processing. 100 files processed off of a USB-2 drive will take much longer than 100 files processed from a USB-3 or Thunderbolt drive. In my experience, working with a USB-3 external drive is perfectly adequate for typical raw files, even when reviewing and processing large 100MP files weighing in at ~110-120MB. Thank you Zac - that's very helpful indeed. Thanks for your post. I've recently converted to Capture One Pro and started using Sessions instead of a catalogue but soon realised that it's not the best solution for all my photographs so switched my old photos to catalogues grouped in five year periods. I didn't have thousands of photos from 2005 to 2015 so it wasn't a mammoth task. My photos of 2016 and 2017 are now in a third catalogue but I began mid 2018 with Sessions and used a different naming structure for them. I'm not sure where to go from here. Should I carry on with the 16/17 catalogue and import the sessions into them, if so can I rename them with the old structure format? Or should I begin a new catalogue and keep the new system structure? The plan is to create sessions for the earlier 2018 photos also using the new structure but I'm in limbo as to what is the best way forward. Can you give me any advice? Hi Nigel, Its difficult to offer advice without a more intimate knowledge of your organization. I don't particularly like the idea of creating sessions for previous shoots, since images can viewed from any session without having to import them. I typically recommend importing previous images into Catalogs. It is true that after you import the session into a Catalog you can completely re-organize and rename the project and various albums in the Catalog's virtual organization that Capture One made when the session was imported. Since that is the case, creating sessions for past images and them importing those sessions into a Catalog would make for several unnecessary steps when you oculd just import the images straight into a Catalog. I would recommend continuing making sessions for new shoots in 2018, then importing them into a Catalog at a later time. Forgive me if I read your query incorrectly. Hope that helps!